The Mad Italian, Chamblee GA – Marie, Let's Eat! As longtime readers of my LiveJournal know, I am fascinated by local restaurant chains, especially the ones that never leave their home base. 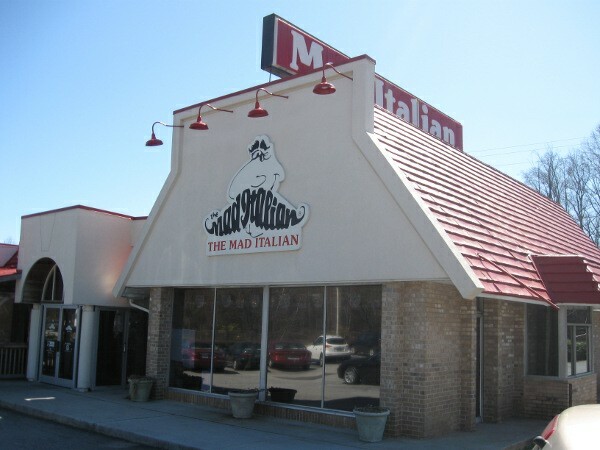 Atlanta has been home to several, and one that has sadly been hit like a freight train during the current recession is the Mad Italian. This wonderful restaurant opened in 1973 on Peachtree Road and claims to have been among the first to serve up New York and Philly-styled sandwiches in the city. The original location is long gone, but for most of my life, there were two others, in Chamblee and in Smyrna. Around 2005, they opened one in Marietta where a short-lived barbecue restaurant had been (nobody seems to remember the name), and in 2006, a fourth location in Alpharetta moved into a site vacated by a McAlister’s Deli. The Marietta store quickly became my daughter’s favorite restaurant, and it somehow fooled my son into thinking that he liked alfredo sauce. Since everything else from Ragu to sauce packs to the offerings at other restaurants have failed to meet his requirements, he eventually gave up and concluded that what he actually likes is Mad Italian’s alfredo sauce and just quit trying to order it anywhere else. Then again, who knows what extra ingredients are in Mad Italian’s alfredo recipe? I took a young lady out for supper there late one Saturday evening in 2006 and we had a blast with the staff, since everybody on duty that night was even more baked than my date’s lasagna. So it didn’t come as a great surprise when the Marietta store closed in 2008, though it was a huge shock when the venerable Smyrna location, where high schoolers used to congregate after Wills High School football games in the eighties, shut down at the same time. Then again, there hasn’t been a Wills High School since 1989 either. Late last year, the Alpharetta store followed them, leaving the Chamblee location as the last man standing in what used to be a northside tradition. For all my lovin’, Mad Italian’s had a curiously poor reputation among locals for years. Back when Atlanta Cuisine had a messageboard (come on, Tom! ), the announcement that the Smyrna and Marietta stores had shuttered had met with really curious glee. Well, sure, any place where the staff can spend even one night visibly stoned stupid can’t say they didn’t have it coming, but I always liked everything on the menu, from the sandwiches (made on very light bread by Cassone Bakeries of New York) to the pasta fagioli soup (tomato-based, with shells, red and white beans) to the incredibly yummy meat sauce. I’m not savvy enough to say whether the pasta itself is any different from anybody else’s, but I really don’t believe I’ve ever had meat sauce as consistently good as Mad Italian’s, despite regular experimentation. The sandwiches have always been terrific, too. I really have not ordered their cheesesteak often enough. There are better in the region, but any of their six-inch sandwiches, served with a small salad and a bowl of spaghetti, will give you a truly satisfying meal. How the Mad Italian has suffered while that Artuzzi’s chain is still around utterly baffles me. My daughter has been pestering me for some time to revisit past triumphs, and since she’s been pretty good lately, I agreed to indulge her. This past Saturday, she and I took a long drive out for lunch here with our frequent dining partner David, whose restaurant choices are consistently good. I believe his family went to the Smyrna location many times in the past, but got out of the habit ages back. Marie wasn’t with us this trip; she and her brother went to Athens to raid that deli I was talking about the other day. I don’t have a lot more to say about the trip. It’s a huge, aggravating shame that the Mad Italian’s fortunes have dipped so badly lately, and that a nearly forty years-old enterprise feels like it’s on its last legs, but it’s still a perfectly reliable place for a really decent sandwich or a big bowl of pasta with good sauce. On the other hand, well, since Marie moved in, we’ve had her unbelievably good sauce recipes with a variety of meats and spices and, to be bluntly honest, as good as Mad Italian’s spaghetti with meat sauce is, I can’t swear that I’ve missed it. It’s a place that does everything pretty well, but there’s not one thing on the menu that I can’t get better someplace else. And honestly, when your nostalgia for a place’s fun history is louder than your present-day enthusiasm, and chuckling about stoned servers is more fun than the meal in front of you, it may be the ultimate sign that you’ve moved on. Posted on March 10, 2010 August 29, 2017 by Grant G.Posted in atlanta, georgia, italianTagged atlanta, chamblee, georgia, italian. 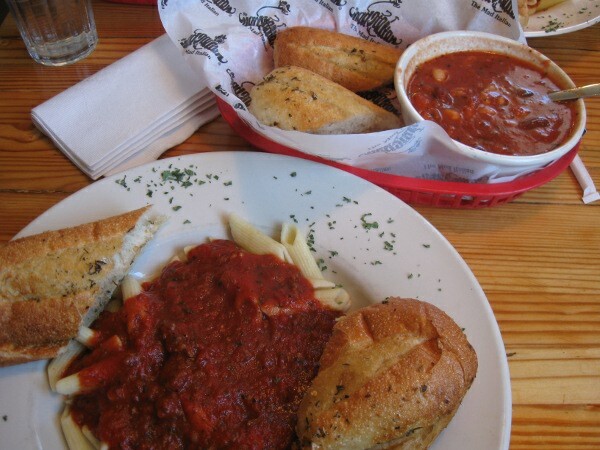 Pingback: CJ’s Italian Restaurant, St. Simons Island GA (take two) – Marie, Let's Eat!